Design and install a chamber of 22000 litres which had temperature and humidity control with accuracy ±1°C and ±3% RH within the range +10°C to 50°C and 20 `95% RH. The chamber also had to meet strict rates of heating and cooling combined with humidity levels also changing during the heat and cool cycles. The customer had tried other solutions to achieve lower humidity levels and high temperatures for their testing, but the other chambers had failed at the ends of the temperature and humidity ranges. Labec designed a high airflow system with steam injection humidity and dehumidifier and larger refrigeration system with PLC control system which could operate very accurately at the desired temperature and humidity requirements. 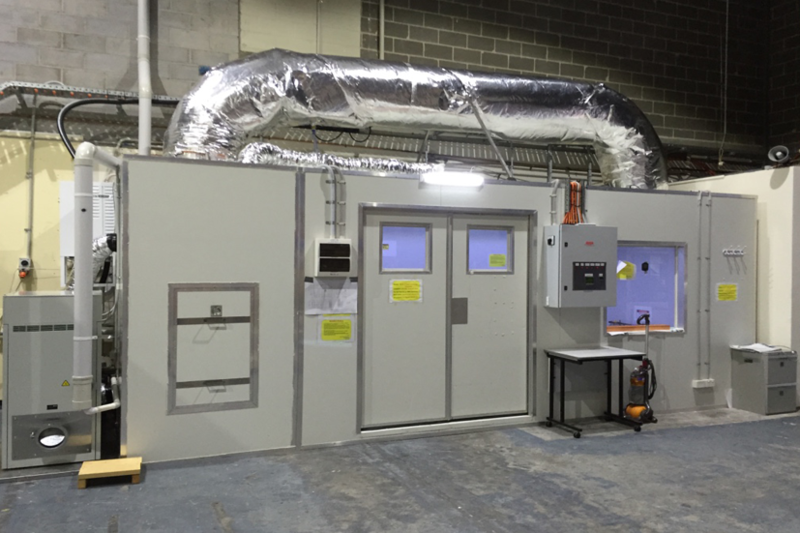 A very efficient chamber which can be operated and controlled and monitored via the control panel or Ethernet cables. The rates of rise and descent for heating and cooling were measured and were very stable and accurate and performed better than the customers expectations.